The original Chinese town in Kuala Lumpur was centred on Market Square. 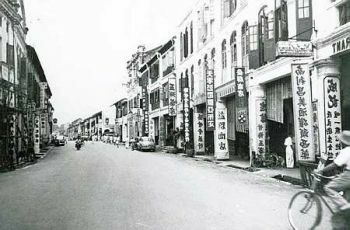 However, as the population grew, High Street, now known as Jalan Tun HS Lee, became increasingly popular as it was higher than the rest of the town and therefore less prone to floods. The population at the time were mostly Cantonese and Hakkas who came to the city because of the tin trade. They worked as coolies in the mines and were governed by a Chinese Kapitan or headman. A civil war in 1870 caused the Chinese community to split into the Cantonese Ghee Hin and the Hakka Hai San secret societies. Even though the British were called in to help end the conflict, the fighting between the two clans caused many buildings in the settlement to be burnt down and severely damaged. The mines were abandoned during the Selangor Civil War. After the war, the miners could not return to work because the mines were flooded. Yap Ah Loy, a famous Kapitan of that time, convinced the miners and coolies to remain in KL. Yap opened a tapioca mill in Petaling Street where the tubers from his farms were brought here to be ground into flour. Some people still call Petaling Street ‘Chee Cheong Kai’ which means starch factory street in Cantonese. In 2003, the road underwent a major RM11.3mil facelift with two large Chinese arches placed at both ends of the street to welcome visitors. It still pulls in many tourists, who go there to shop and will be regarded as a heritage site.